This functionality depends on the presence of BridgeOS hardware, like the A10 Fusion coprocessor. If the accounts are correct, the coprocessor would also take over the boot process, security, and the FaceTime camera, running a stripped down version of iOS as BridgeOS. Guilherme also discovered the "Hey Siri" setup on macOS, which is identical to the one on iOS. This would conveniently allow users to use Hey Siri instead of the required click or keystroke to invoke Siri. Twitter user "tipoo" mentioned that the old A8 processor had "Hey Siri" support when connected to power, while the A9 supported the feature on battery power. So if Apple implements the A10 in the iMac Pro, the company likely has bigger plans in mind, such as sleep handling, idling, background downloads and more. Offloading those tasks to the A10 chip could leave the main Intel processor alone, helping with power consumption and performance. Although "Hey Siri" is an interesting feature to have on an iMac, an A10 Fusion coprocessor could also support SecureBoot on the iMac Pro. This means that Apple could be using the A10 Fusion chip to handle the initial boot process and confirm the software checks out before passing the startup process off to the regular Intel processor in your Mac. With an Apple-designed coprocessor, even more possibilities for new features open up in the future, like the addition of the Secure Enclave to allow some sort of implementation of the iPhone X's Face ID to come to iMacs in the future. Apple Pay on iMacs currently authenticates using your connected iPhone's Touch ID, Face ID or unlocked Apple Watch. Face ID on the iMac would finally allow it authenticate purchases without a nearby device. There's also a possibility that Apple could release a Magic Keyboard with Touch Bar and Touch ID. The A10 Fusion processor comes directly from the iPhone 7 and 7 Plus, and a beefed up version of it is founded in the latest iPad Pros. 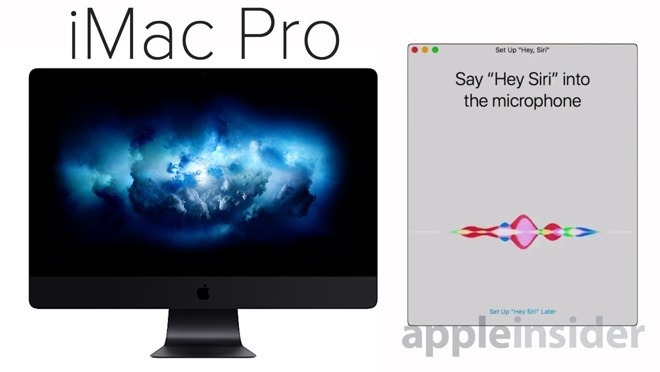 Bringing the A10 to the iMac Pro could allow it to natively run iOS, offering features that previously required an iPhone or iPad, like running iOS apps from the App Store.